I want to share a story of something that happened tonight. You see, we went out and saw our neighbors doing some yard work – moving rocks from the front to the back yard. We decided to all pitch in and help as a family. Maggie could pull some weeds, and I could do some of the heavy lifting of shoveling and transporting the rocks to the back yard. But our little guys pitched in too. 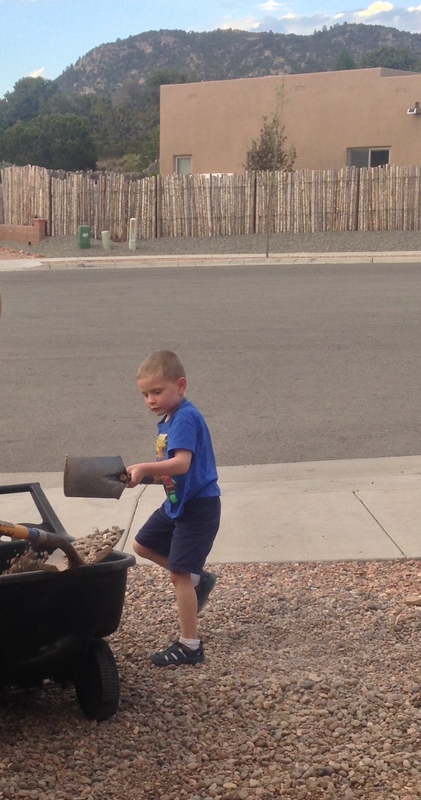 Alex, Jack and Luke each grabbed a rake or shovel from time to time and each contributed their part in the process. Here are some pictures. Now, none of their “scoops” was as big as mine. But it would be wrong to judge their contribution as being less significant than mine. Their contribution, though smaller, was just as significant because it was part of a greater work, or end. We had to get the rocks from the front to the back, and every “small” scoop they contributed, was one less scoop I or someone else had to tackle. Their contribution – though small – was significant. This reminded me of a story in the Bible where Jesus went out and was teaching a group of people who had followed Him. After several hours, everyone started to get hungry, but no one had thought of a plan, let alone brought provisions to feed everyone who showed up – over 5,000 people in total. When Jesus asked His closest followers about a solution, their response was to simply tell the people to go elsewhere and find food. They had nothing. There was nothing they could do or provide that would have made a difference. But there was someone – a little boy in fact – in that crowd who heard what was going on and decided to step up to Jesus and offer what he had – five loaves of bread and couple of fish. It would have been the equivalent of an elementary school kids packed lunch from his Mom. But this kid was willing to offer his small gift to contribute to the need. What I witnessed tonight with my own kids reminded me of this simple, yet profound fact: there is no such thing as a small, insignificant gift when it’s put in the hands and in the service of Jesus. Because Jesus is the one who makes even small gifts significant. Which is why I want to ask each of you who are reading (or watching) this, to respond in two ways. You see, as some of you may already know, we have been in the process of raising funds for a church planting work in a growing city in the Fort Worth metro area, Mansfield, TX. So far, we are at 33% of our 2 year financial goal. Now we are excited about that, and so thankful for everyone who has already jumped on board and contributed. But we still have a ways to go, and I leave for Mansfield this Saturday (May 31, 2014). The first response I want to ask you to make is to give a small financial contribution to our church planting work in Mansfield, TX. If every one of you who are my friends on Facebook, or followers on Twitter or my blog, or a connection on LinkedIn, in my circle of Google+, or someone who received this because a mutual friends shared it with you, were to contribute a small one time donation of $50 (or a monthly donation of $4.17 for 12 months), we would reach our 2 year fund raising goal of $100,000. These funds will go to the operational budget of our church planting work. Some of you may have already been thinking about supporting us, or perhaps you could support at a greater (or lesser) amount, and I want you to know that we would love to have you come on board at whatever amount you are comfortable with giving. Please know that 100% of your donation will go to this work directly, and is considered a tax-deductible gift. To give, go to www.frontiermissionproject.com and choose the best option for you and your situation. Now some of you who are my friends, followers or connections online, don’t share my same belief as a Christian, and you’re probably thinking, “Why should I get behind and support you planting a church?” I’m glad you asked, and I will be posting a second post (and video) explaining why I believe that even if you do not share my same belief as a Christian, or are skeptical, maybe even hurt by your experience of organized religion, that there is a legitimately good reason to support this kind of work. Watch for this tomorrow sometime. The second response I want to ask you to make is to Like, Share, Retweet, and send this post (or video) to your own network of friends, followers and connections. When you do, please give a quick word or two as to why you’re sharing it. It could be something as simple as, “Check out what my friend Chris Gensheer is doing and be a part of it. I just did!” or whatever else you may want to say. But it would be very helpful, and meaningful, to help spread the word about what we’re doing and give others the opportunity to jump on board. I also want to offer you all something in return for jumping on board and giving any donation you want to give to this work as a small token of my appreciation. Like any good crowd-funded campaign, I have a series of gifts, or offers, to give you for your partnership and participation in this work. Any gift of any amount = Enrollment in our Ministry Updates and Prayer Newsletter, an opportunity to go out for coffee or some other drink whenever you’re in Mansfield (and I’m available to meet), and my undying love and gratitude. Any gift of $50-$99 – A short essay (PDF) on the intersection of the Christian church and public good (original work of mine, to be completed by August 15, 2014), enrollment in our Ministry Updates and Prayer Newsletter, an opportunity to go out for coffee or some other drink whenever you’re in Mansfield (and I’m available to meet), and my undying love and gratitude. Any gift of $100 or More – A small group Lenten devotional through the Gospel of Mark (original work of mine, to be completed by August 25, 2014), a short essay (PDF) on the intersection of the Christian church and public good (original work of mine, to be completed by August 25, 2014), enrollment in our Ministry Updates and Prayer Newsletter, an opportunity to go out for coffee or some other drink whenever you’re in Mansfield (and I’m available to meet), and my undying love and gratitude. To receive these gifts, please email me at frontiermissionproject@gmail.com and let me know that you are jumping in and wanting to support this work and at what amount. Thanks guys. Now lets see what King Jesus can do when we entrust Him with our small gifts and look for Him to do significant things with each one! Chris Gensheer is the Lead Pastor of Christ Presbyterian Church, Mansfield, TX, a growing suburb of Fort Worth. Find out more about his vision for ministry in reproducing worshipping communities on mission and give your prayer and financial support to the work of Frontier Mission Project.